People with this dual diagnosis present a unique challenge to RDs, who must help them not only control their blood glucose but also successfully avoid gluten. Two women walk into a bar. One has type 1 diabetes; one has celiac disease. How many gluten-free, carb-controlled meals do they order? Two, naturally: One for the woman with both conditions and one for her friend, who orders it purely out of sympathy. In real life, that scenario is more complex and could have involved many more questions about preparation methods, ingredients in the sauces, calculations, and perhaps a quick call or text message to a dietitian with expertise in the crossover area between diabetes and celiac disease meal planning. Learning how to eat healthfully with these comorbidities is essential to managing them, and RDs can provide valuable guidance. The following offers an overview of how the two conditions are related, concepts for combining diet therapies, and examples of how RDs are rising to the challenge of ensuring optimum nutrition for clients dealing with both diabetes and celiac disease. By way of brief review, recall that both type 1 diabetes and celiac disease are autoimmune conditions. In type 1 diabetes, the body’s pancreas makes it difficult to process energy from food. Antibodies act against the pancreatic islet until the beta cells make little to no insulin, disrupting the hormone that would normally signal glucose to enter cells and produce energy. Treatment involves daily insulin in addition to carefully planned meals and physical activity. In celiac disease, eating gluten, which is found in grains such as wheat, barley, and rye, causes a specific immune reaction that leads to inflammation and damage to the lining of the small intestine. Eventually, abnormal digestion and absorption will lead to malnutrition and its sequelae. Currently, the treatment is eliminating gluten from the diet, along with education to help patients meet their nutritional needs. Both type 1 diabetes and celiac disease are associated with the human leukocyte antigen (HLA) class II genes on chromosome 6p21. Before moving on, it may be useful to review a few genomics basics. Genes come in sets at any given location (called a locus, or loci) on a chromosome, and the sets are made of alleles, which can be both recessive, both dominant, or one of each. Alleles are responsible for inherited characteristics such as blood type or susceptibility to celiac disease. Antigens prompt the creation of antibodies and cause an immune reaction. The HLA system is the name of the major histocompatibility complex (MHC), or the cluster of genes with an important role in the immune system that lives on human chromosome six. The HLA class II genes are important in immune system activities and they are named DR, DP, and DQ. Further evidence that type 1 diabetes overlaps with celiac disease on a genetic level was reviewed in the Journal of Clinical Endocrinology & Metabolism.3 The clinical review indicated that patients with type 1 diabetes with DR3-DQ2 (a combo set of genes strongly linked to celiac disease) would have an increased risk of celiac disease compared with the general population. A patient with type 1 diabetes who may have two sets of DR3-DQ2 (one from each parent) has a one in three chance of also having the antibodies that self-attack in celiac disease (tissue transglutaminase [tTG] antibodies); in the general population, 3% of people with DR3-DQ2 (either one or two sets) will also have celiac disease. • Patients with type 1 diabetes should be screened for celiac disease using tTG antibodies or endomysial autoantibody (EMA), with documentation of normal serum immunoglobulin A levels. Testing should occur soon after the diabetes diagnosis and subsequently if growth failure, failure to gain weight, weight loss, or gastroenterologic symptoms occur. • Positive antibody levels should be confirmed. • Individuals with confirmed elevated tTG or EMA antibodies should be referred to a gastroenterologist for consultation and will usually require a small-bowel biopsy. • Individuals with type 1 diabetes and confirmed celiac disease should follow a gluten-free diet. • Consultation with an RD experienced in managing both diabetes and celiac disease in children should be obtained. • Consideration should be given to periodic rescreening of patients with negative antibody levels. The goals of treatment are to meet and maintain blood glucose control and remove gluten from the diet. It may help to start with diabetes meal planning and then adjust the diet to remove gluten. Below is an outline of steps for combining diet therapies; however, for more in-depth information, referring patients to dietitians with expertise in these areas is always advisable. Step 1: Assess Diet Knowledge and Needs. Take a detailed diet history to get a good idea of usual intake and then get to know how well the patient understands carbohydrates and how to plan meals to control blood glucose. Review if needed. Step 2: Eliminate Obvious Gluten. Assuming that the patient can plan and adhere to a diabetes diet, the next step is to educate the patient on major sources of gluten, such as wheat, barley, rye, commercial oats, and wheat-related spelt and triticale (in the form of breads, pasta, cookies, and crackers). Step 4: Give Detailed Diet Education. See the sidebar “Counseling Checklist for Getting the Gluten Out” (below) for an overview of education topics to review with your patient. Step 5: Monitor and Assess Results. Monitor blood glucose closely as the patient begins to follow a gluten-free diet, making adjustments to meal planning or insulin needs as appropriate. (Insulin needs will change as the small intestine’s villi heal and nutrient absorption improves.) Track weight, hemoglobin A1c, and insulin needs. Specialty gluten-free foods can be expensive, so be prepared to offer low-cost alternatives. There are many naturally gluten-free foods to choose from, including potatoes, rice, corn, rice crackers, cornmeal, lentils, legumes, popcorn, corn tortillas, fruits, vegetables, meats and meat alternatives, milk, and cheese. Experts share their insights on effective ways to manage the practical challenges—from hidden gluten to weight gain—that arise when counseling patients with both type 1 diabetes and celiac disease. Cross-contamination is a major concern, according to Carol Brunzell, RD, LD, CDE, of the Diabetes Care Center at the University of Minnesota Fairview Medical Center in Minneapolis. “Patients need to be scrupulous with their food handling if they are sharing a kitchen with other people. They need their own storage containers, toaster, and jars of spreads (eg, jam, mayo, margarine),” she says. Ordering at a restaurant can be daunting for someone trying to avoid gluten. Brunzell says to watch out for French fries and other deep fried foods such as corn chips, taco shells, wings, and plantains that may have been cooked in a common fryer along with breaded items. She also counsels people to avoid soy sauce and California rolls (sushi) that contain artificial crab, since both contain wheat. It’s important to speak up when eating out. Rather than avoid trying a dish that looks enticing on the menu, ask questions. For soups, ask if they contain wheat or barley; same goes for sauces. Ask if the meat has been dusted in flour before cooking. Simpson recommends that patients with celiac disease and type 1 diabetes get their carbohydrates from whole grains such as brown rice, quinoa, amaranth, buckwheat, and gluten-free oats. For baking, Simpson suggests trying chickpea, soy, and bean flours, which provide protein and fiber. Recipes and meal ideas are available through many of the celiac support Web sites. Weight gain can often follow the initiation of a gluten-free diet, says Simpson. That’s because prior to diagnosis, patients with celiac disease may not have been properly absorbing nutrients. Also, prepared gluten-free foods may be higher in calories than their standard counterparts. For example, a typical slice of whole wheat bread has 70 kcal, while a slice of gluten-free bread can often contain more than 100 kcal. Simpson says, “Patients get frustrated that they are gaining weight and need advice on how to control weight while following the gluten-free diet. They may also find cholesterol levels increasing and need advice regarding how to control cholesterol.” She recommends a diet that includes fruits, vegetables, low-fat dairy products, legumes, lean meats, poultry, fish, and gluten-free whole grains to control weight and cholesterol. A good resource is www.glutenfreedrugs.com, which lists gluten-free medicines and some vitamins. The Resources section of this article also includes Web sites devoted to celiac disease that can help people find many gluten-free foods and products. Brunzell suggests patients subscribe to newsletters from these organizations to stay updated about new products. Patient education should include an in-depth tutorial on food labels. Key ingredients to beware of are wheat, barley, malt, rye, and commercial oats. (Specialty gluten-free oats are available.) Simpson appreciates that wheat ingredients are called out because they are a top allergen, but other gluten ingredients are still a danger to those with celiac disease. Simpson points out some surprising foods that may contain gluten, including licorice and wheat-free bars and cereal that contain commercial oats. Another challenge Brunzell encounters is getting people to stick to a gluten-free diet when they don’t have any obvious symptoms. She emphasizes how important it is for those people to follow the diet strictly and understand that even though they are not experiencing symptoms, eating foods that contain gluten will still do damage that can lead to serious health consequences. Two dietitians walk into a bar. One is a certified diabetes educator, and the other is an expert in counseling patients with celiac disease. Who will see the patient with both conditions? They both will—by working together. 1. Green PHR, Cellier C. Celiac disease. N Engl J Med. 2007;357(17):1731-1743. 3. Barker JM. Clinical review: Type 1 diabetes-associated autoimmunity: Natural history, genetic associations, and screening. J Clin Endocrinol Metab. 2006;91(4):1210-1217. 4. Silverstein J, Klingensmith G, Copeland K, et al. Care of children and adolescents with type 1 diabetes: a statement of the American Diabetes Association. Diabetes Care. 2005;28(1):186-212. 5. Kupper C, Higgins LA. Combining diabetes and gluten-free dietary management guidelines. Practical Gastroenterology. 2007;31(3):68-83. 6. Simpson S. Combining the gluten-free diet with a diabetes meal plan. 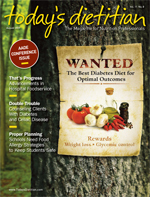 Newsletter for the Medical Nutrition Practice Group of the American Dietetic Association. 2008. In the bottom of a large bowl, combine dressing ingredients and whisk well. Add remaining ingredients, toss, and serve chilled or at room temperature. Store in the refrigerator for up to five days. This marinade is perfect for chicken, pork, shrimp, tofu, or vegetables. In a food processor fitted with a steel blade, combine garlic, ginger, green onion, jalapeño, and cilantro. Pulse until ingredients are finely chopped. Transfer to a bowl. Add tamari, vinegar, honey, and canola oil. Stir to combine.